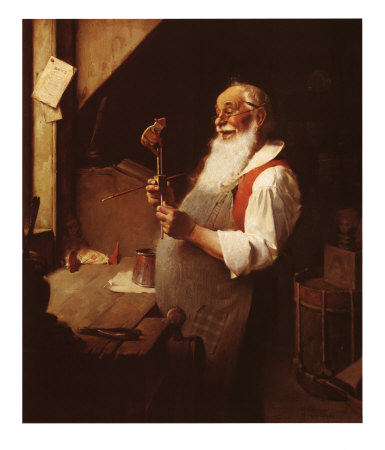 Santa's Workshop, a Norman Rockwell Christmas painting, started as an advertisement in the December 14, 1922 issue of Clintonville Gazette. Originally published in The Clintonville Gazette, this painting was an advertisement commissioned by the Western Newspaper Union. I am unsure whether the ad appeared later in other publications. Readers in Clintonville, Wisconsin, were very lucky indeed. At this point in time, Rockwell was a very in-demand illustrator for advertisements. He was still cranking out ten to twelve Saturday Evening Post covers, along with covers for several other magazines. Yet he still found time and energy to illustrate a couple dozen advertisements like this. Santa is busy in his workshop, making toys. The date is December 14, 1922. He still has two more weeks to finish this year's work. Still, two weeks is cutting it pretty close. Santa is still jolly. He still takes delight in every toy he makes. He has just finished painting this new toy. Does anybody know what kind of toy this is? Santa certainly appears to be enjoying it. The elves must be on their lunch break, because they are nowhere to be seen in this painting. In the background on the left, we see a clown doll. Santa will work on this toy next. And tacked up on the side of the window is Santa's to-do list. I hope there's something on there for me! In the background on our right, we can see the toys that Santa has already completed. There is a drum and a Jack-in-the-box.